DirectTV brought a human claw machine. You strap in and attempt to catch teddy bears. There’s also old-school video game consoles to play. Super Bowl week is officially here, and the formal festivities kicked off downtown on Saturday with the opening of Super Bowl LIVE—the free fan fest in Centennial Olympic Park that features the concerts curated by Jermaine Dupri—and the Super Bowl Experience Driven by Hyundai—the not-free, gigantic fan event taking place in Building B of the Georgia World Congress Center. 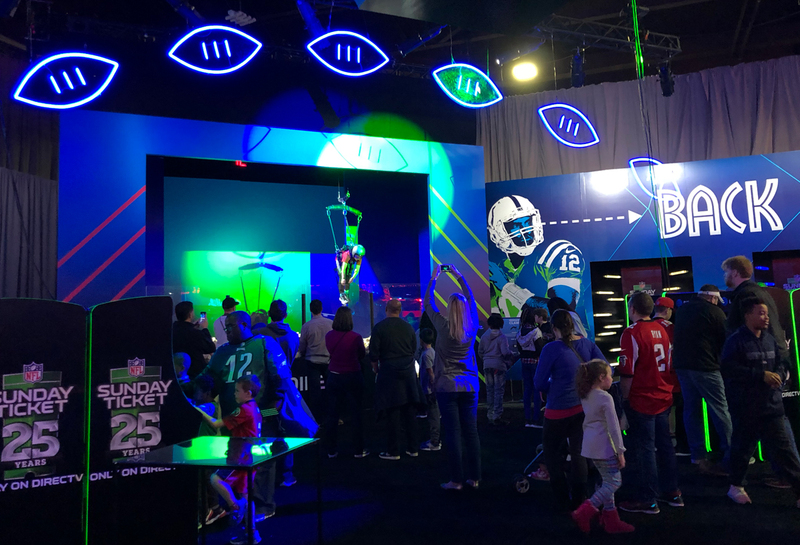 Experience is packed to the brim with games and attractions: you can view the actual Lombardi Trophy, all 52 Super Bowl rings, play plenty of football-themed games and challenges, get free autographs from players past and present, and of course, explore the official Super Bowl gift shop. Since the Experience is monstrously big (800,000 square feet), here’s a quick primer to help you better navigate it. This centerpiece in the Experience gift shop was designed to resemble Mercedes-Benz Stadium. 1. Go before Thursday. Seriously. Tickets to the Experience can be a bit pricey—on January 26 and 27, adult tickets are $40 and kids’ tickets (ages 12 and younger) are $10. But on Super Bowl weekend, those prices jump to $40 for adults and $25 for kids. 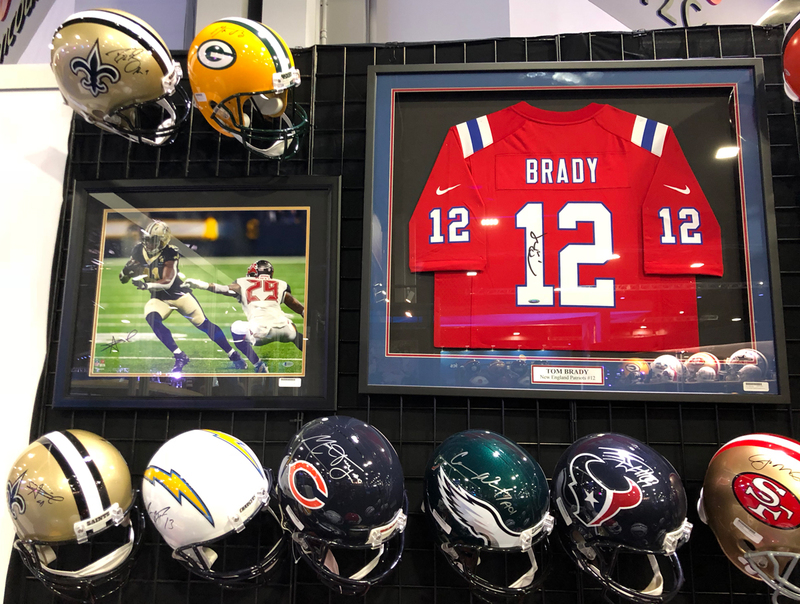 Not to mention, lines form for just about every experience, and once out-of-towners arrive for the big game on Thursday, you better believe that some of the wait times for major attractions like the Lombardi Trophy and the free NFL player autograph station are going to be extensive. 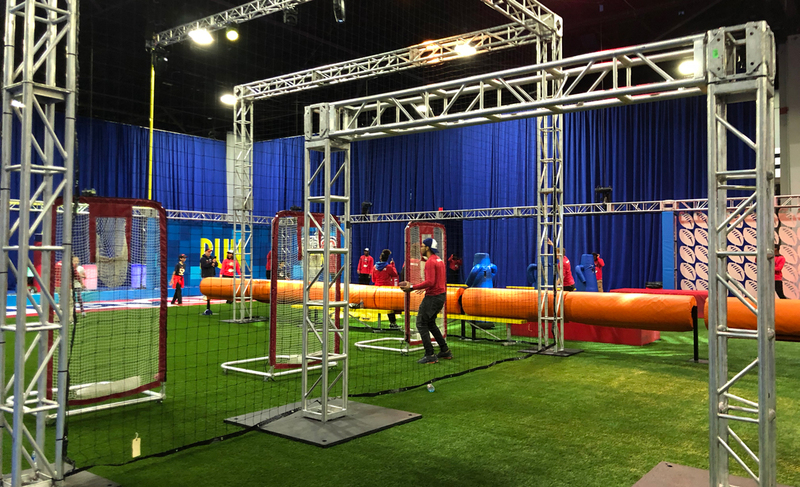 Here’s a life hack for designed for Atlantans—on Monday through Wednesday, the event is open from 3 p.m. to 8 p.m. (10 p.m. on Wednesday), and adult tickets will cost just $20 and come with up to three free kids’ tickets. The traffic was light when I visited on Saturday with short lines throughout, so take advantage of the lack of crowds to get the most enjoyable (and most affordable) experience. Note: During a press conference Monday, officials said that if you purchased a Tuesday ticket in advance and won’t be able to use it due to the predicted snow/ice, it will be honored on Wednesday. An impressive metallic helmet wall sits in front of the replica lockers. 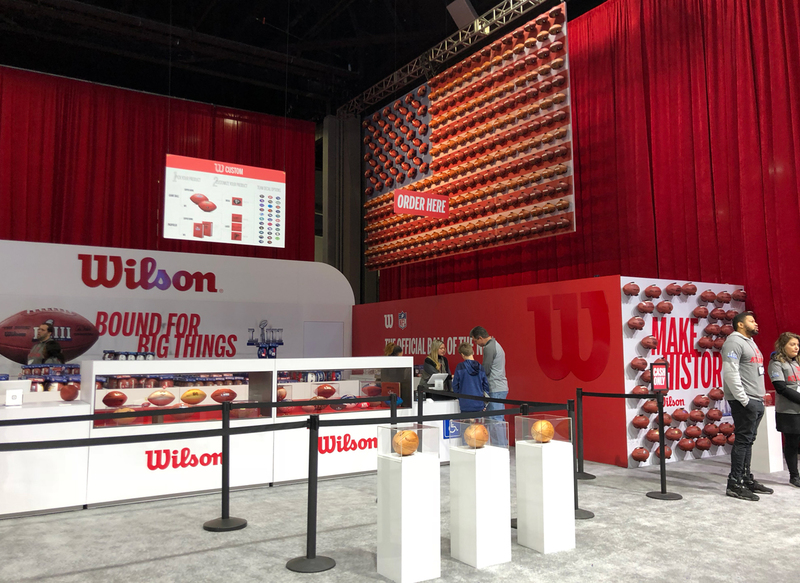 This Wilson area makes custom footballs on-site. 2. Expect to spend the whole day (or evening) there. Again, the experience is 800,000 square feet and stuffed with activities that take varying amounts of time to complete, not to mention the time you’ll spend perusing the gift shops. At the media preview, a spokesperson said to plan to spend three to four hours at Experience; I spent a little over five. One could easily stay there much longer. 3. Wear athletic shoes—and consider short sleeves. It may be cold outside, but a lot of the activities inside the Experience are of the physical variety—kicking field goals, testing your vertical jump ability, throwing passes, etc. You’ll get toasty quickly. Even if you don’t play the games, you’ll be standing and walking a lot, so dress as comfortably as you can. 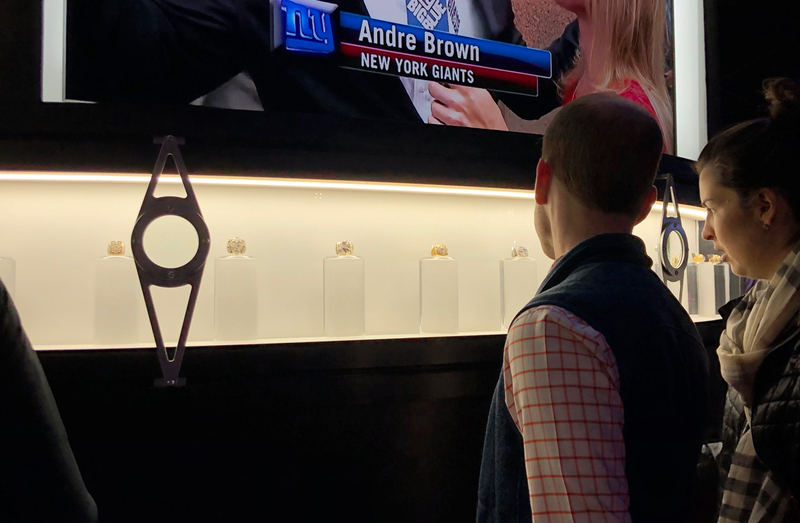 You can view all 52 Super Bowl rings in this display, which has multiple magnifying glasses to allow you to better see the details. 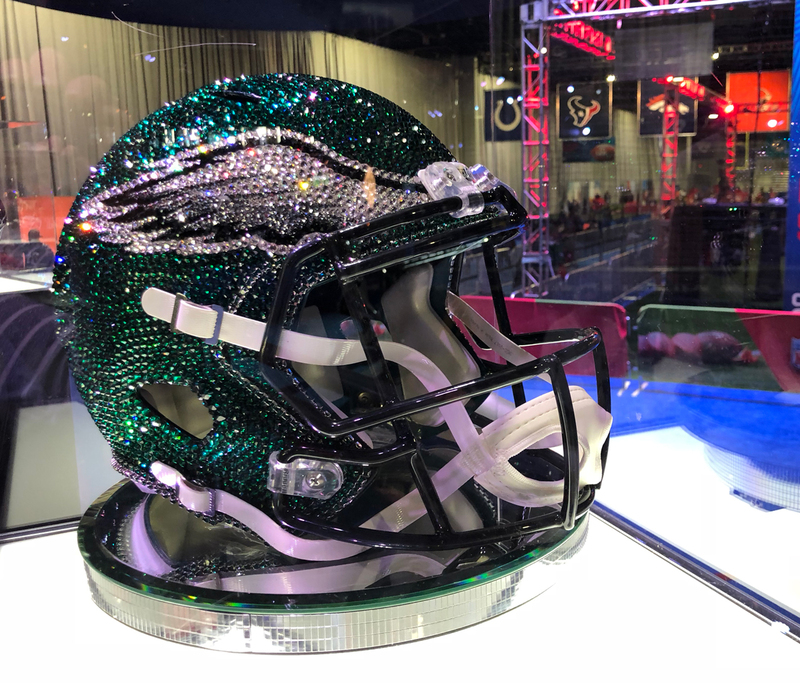 These Swarovski crystal helmets also sparkle near the Super Bowl rings. 4. Download the Super Bowl LIII app ahead of time and register for the Fan Mobile Pass. This is also true for Super Bowl LIVE—nearly every major attraction requires you to either scan a QR code with the Super Bowl LIII app or to read your unique Fan Mobile Pass code to an attendant. The account is free and doesn’t take long to set up, but it does ask for some basic personal information and requires you sign a waiver. 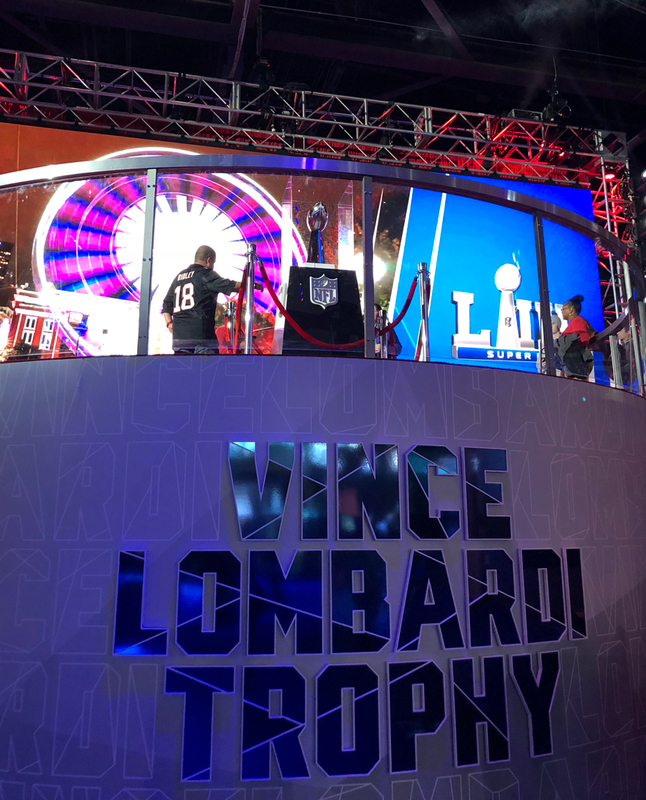 The app is 100-percent integrated throughout the event—not only does it check you into lines, but attendants will use their own devices to take your photo at the Lombardi Trophy, sending that photo directly to your app for you to download. 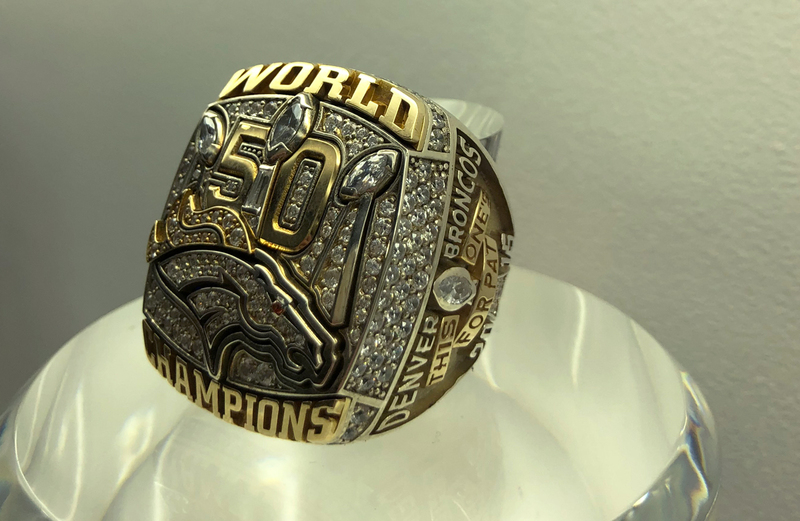 Want a picture with a virtual Super Bowl ring Photoshopped on your hand? That, too, will be downloaded straight to your app. It streamlines a lot of the activities and there’s a gamification aspect too—scan enough QR codes and you’ll be entered to win prizes such as tickets to the Bud Light Super Bowl Music Fest and the Super Bowl itself. This gift shop, located near the entrance and box office of the Georgia World Congress Center Building B, is free for anyone to enter. 5. There’s a gift shop upstairs that is free for anyone to enter—no tickets required. 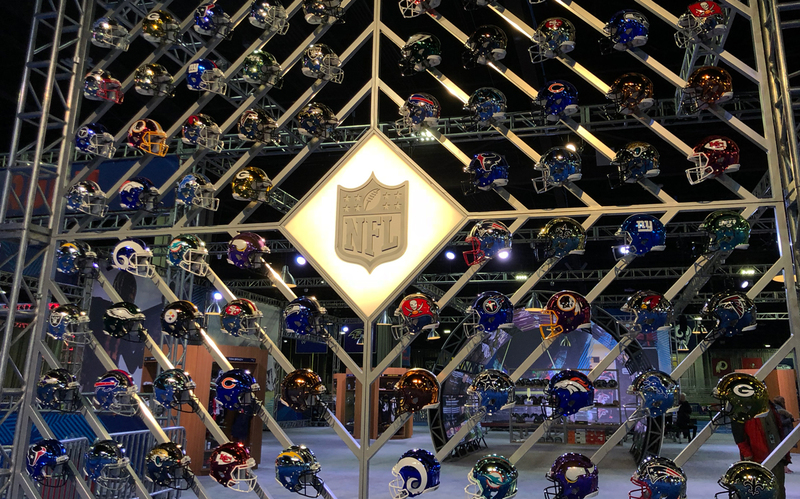 This might be one of the best hacks of the entire Super Bowl—inside GWCC Building B, near the box office for Super Bowl Experience, is a large gift shop that sells a plethora of official Super Bowl and NFL merch. There are two entrances, both with large banners nearby. This store doesn’t require an Experience ticket to enter—you just have to go through the metal detectors to enter the building. It’s much larger than the gift shop at LIVE and sells things like autographed helmets and jerseys from all 32 teams, along with lanyards, pins, all kinds of apparel, custom socks, mugs, bags, whatever you could imagine. 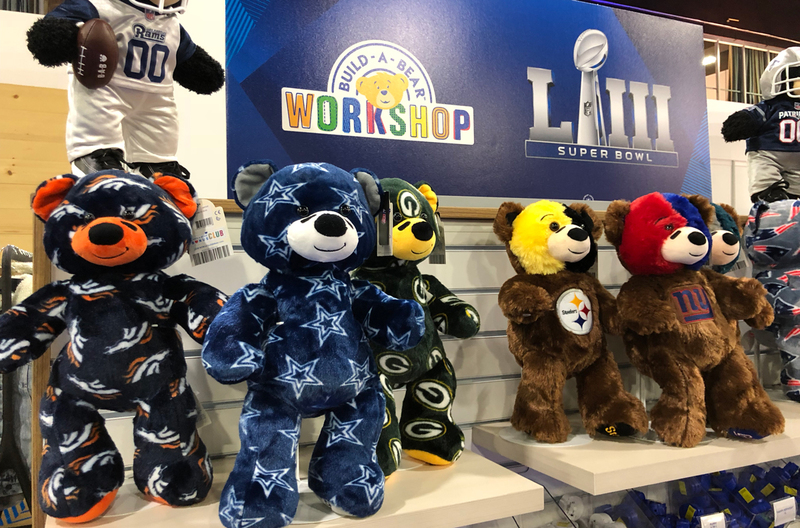 The gift shop inside Experience has a few notable additions—a Build-a-Bear Workshop, custom denim jackets, and the official Super Bowl jerseys to name a few—but this free one will thrill any football fan. If you want these guys, however, you have to pay for the Experience. Be prepared for lines to see this bad boy. 6. You will stand in line for a long time to see the Lombardi Trophy. Even with the light crowds on Saturday, I still stood in line for an hour to see the trophy, and my line only filled half of the allocated queuing space. The Experience makes the wait entertaining, playing Super Bowl-themed films on a giant screen while you wait (I learned a lot about the 1985 Chicago Bears). But once you get to the trophy, it’s a quick snap of a photograph and off you go. I didn’t even really get a chance to look at it up close. No doubt it’s a cool photo opp and I don’t regret doing it, but if you’re on the fence about waiting in the line, your time might be spent better elsewhere. The body-casts allow you to literally become a player on your favorite team. 7. It’s enjoyable no matter which NFL team you cheer for. All 32 teams are represented throughout the event. The Falcons dominate for obvious reasons, but there is something for every fan. 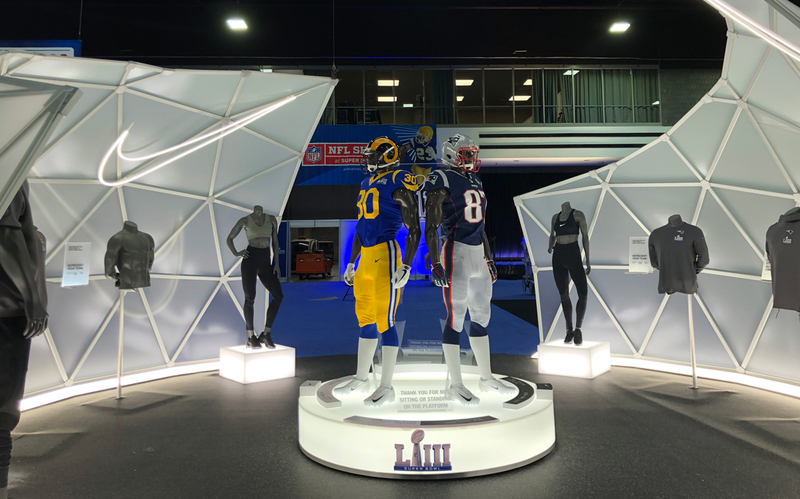 Near the Lombardi Trophy are “uniformed body-cast molds”—essentially giant empty player suits that you can stand behind and pose as a player on your favorite team. 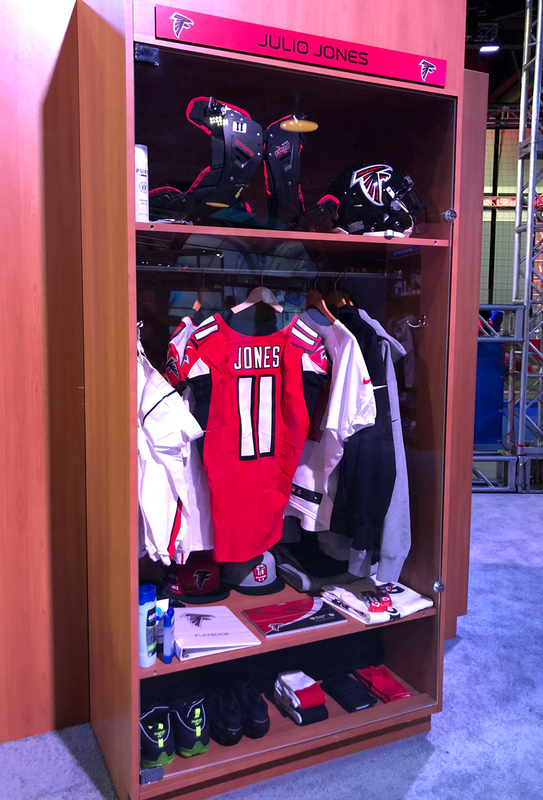 There’s also a replica locker for every team, so you can peek inside the locker of Julio Jones, Aaron Rodgers, Andrew Luck, Drew Brees, Tom Brady, Aaron Donald, and many more. 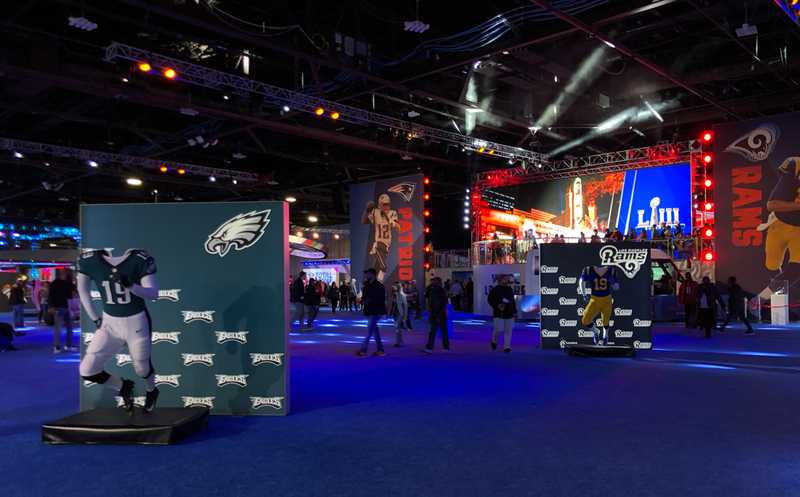 The NFL Draft experience lets you go on stage holding the jersey of your favorite team, where you’ll be declared the number one draft pick for 2019. (Pro tip: Write your name phonetically on your draft card for the announcer.) Go ahead and wear your favorite fan gear and try to see if you can spot one fan for every team while you’re there—I’m pretty sure I saw fans sporting jerseys for at least half of the teams in the NFL on Saturday. 8. It’s great for kids. 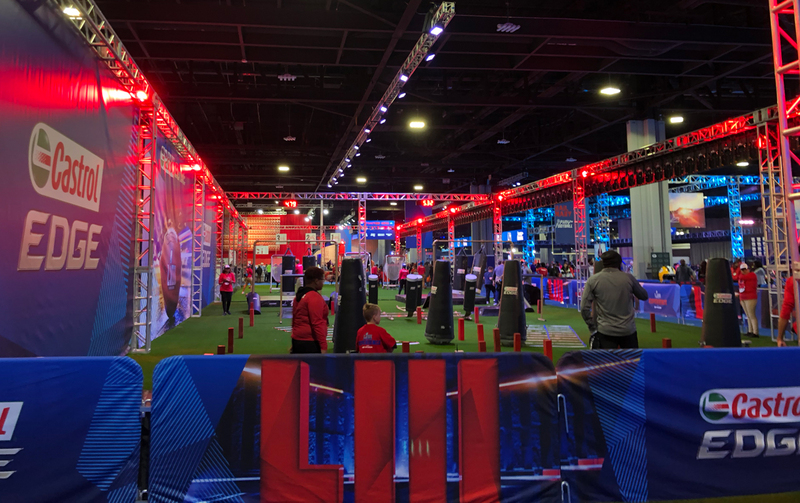 While the Play 60 area is the designated “kids zone” with football-themed games and Falcons coloring pages, the entire exhibition is kid-friendly and features a ton of games that are often better suited for youngsters than adults. Even the Pizza Hut zone, which does give away free small slices of pizza (!! ), has a dance area that was perpetually filled with flossing seven-year-olds. It’s one giant playground and kids will wear themselves out running through obstacle courses and playing flag football. You’ll pick up a few as you explore, either from plinko games (the Panini game gives away packs of NFL trading cards) or autograph stands. A purchase from the gift shop will earn you a large reusable tote bag, but bringing your own tote (no larger than 18 x 16 x 8 per the NFL’s rules) is not a bad idea. There’s plenty of collectables to be had. 10. If you’re an impulse shopper, set a budget ahead of time. It’s easy to get caught up in the excitement and drop some serious cash in the gift shop, so if you’re prone to impulse shopping, give yourself a dollar limit before you go. Also, be aware that food pricing is stadium/festival-esque: a bottled Pepsi costs $5; a hot dog is $7. But the Bud Light Tavern—the bar area located across from the autograph stage—is a pretty nice place to take a break, with bar stools bearing the logo of every team, pool tables, and a nice view of the landscape around you. 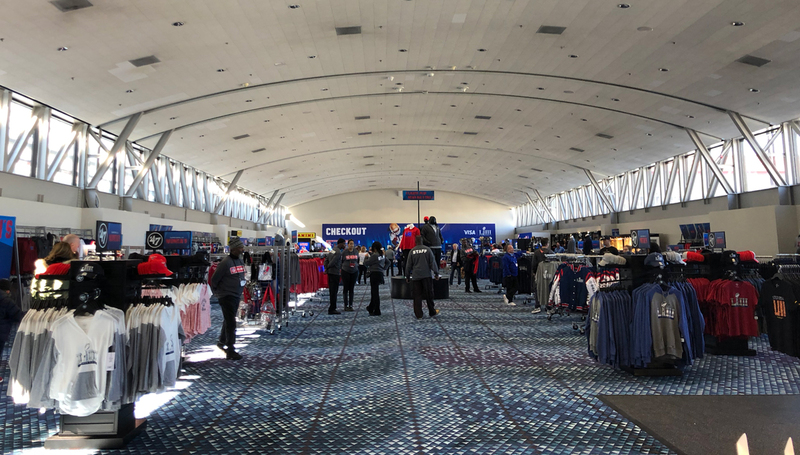 Correction: This story originally said the only entrance to the free gift shop inside GWCC was to the left of the box office. There are two entrances—one on the left and one on the right.